Are you wondering what happened to the Watsonville Fly-in and Airshow? Sad to say that there has been a change. Attendance had declined over the years. They tried changing the dates from May to September… even October, but even as a non-profit they need sponsorships to keep things going and they just couldn’t get enough. In 2014, they celebrated the 50th Anniversary of the Fly-in. In 2015, they asked the City of Watsonville to run the show. They did have a one day event. 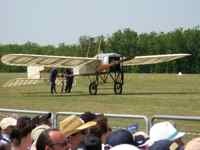 No aerobatics or performances… just a fly-in of antique and historic aircraft. We’re sad too. We'll leave the old report up... it was a fun little air show. …but on the Central Coast of California, that can often mean cool and foggy days. When that fog would roll in, planes often had to stay on the ground. But we all love seeing them fly don't we? They moved it to Labor Day weekend from 2010 to 2013, but it was October for 2014. 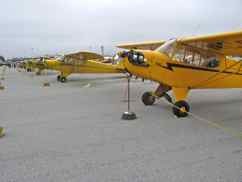 October can have some of the best weather, so here's hoping these dates will let the Watsonville Fly-in get more antique airplanes in the air. Check their website for future dates... we haven't seen any posted yet. 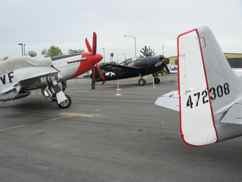 Watsonville is a small town, and this fly-in and air show has a small town feel, but it's a big event. It has a nostalgic feel... the feel of a county fair... the seating is on hay bales located in prime viewing areas. It's really a Saturday/Sunday event, but sometimes we've gone on Friday afternoon to watch arrivals. 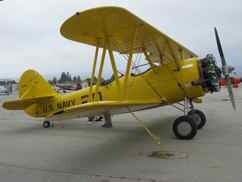 It's been a major antique-airplanes event at the Watsonville airport since 1964. Through the years it grew from a small, grass roots event to one of the largest fly-ins on the west coast.... 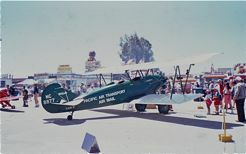 It became known primarily for a world-class exhibit of antique aircraft. 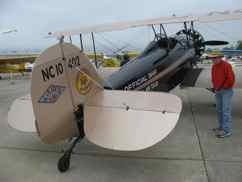 More than 300 classic and antique airplanes have been on static display in some years. Planes like this Travel Air 4000. How would you like to have been there the year they had the 1930s Air Racers Miss Los Angeles and Little Pete? 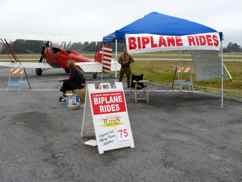 There are some vintage airplane rides available for purchase the day of the event and sometimes helicopter rides too. All the usual air show type food is available, and as is the usual contingent of aviation related commercial vendors. The weather in California is generally better in the Fall than it is at the end of May. We're hoping, along with the show organizers, that the weather will be good at this time of year... but remember, you are very close to Monterey Bay, so you can still expect some early morning and late afternoon fog to roll in. 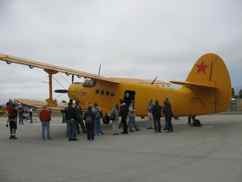 Rain is really unlikely in the Fall, but the organizers say the Fly-In and Air Show will go on rain or shine. We're just hoping the event continues into the future. We'll be moving our "annual" barbecue with our flying friends to the fly-in weekend. We love swapping flying stories and going to the fly-in. Where is the Watsonville Fly-In? Watsonville Municipal Airport is located on the Central Coast of California between Santa Cruz and Monterey. The easiest route to the airport by vehicle either northbound or southbound is on Highway 1 using the Airport Boulevard exit. Volunteer car traffic controllers will direct drivers on Airport Boulevard to the main auto entrance a half-mile east of the main terminal. Going east, you'll turn left into the auto parking gate; and going west, you'll be directed to turn right. Shuttles will be available to take you to the main gate. There are plenty of hotels in the area.... a few in Watsonville and many in Santa Cruz and Monterey. The fly-in offers a limited amount of camping spots for RVs. If you are participating in the fly-in, camping is permitted by your planes as well. A limited amount of aircraft camping space is available for non-participants. 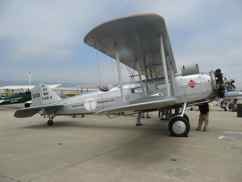 The Watsonville Airshow and Fly-In website has been closed down. Check with the city or the local paper to see if they have their one day Wings Over Watsonville event in the future. 2009 was the last year the fly-in was held in May. It was high overcast and cold, but there was enough visibility for planes to land... and there were some good planes there. Mark really wanted to see the rare 1929 Boeing 40C. As far as we know, that is the only flyable one in the world. 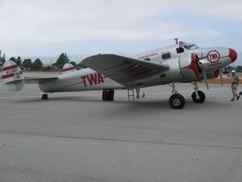 How about a Lockheed 12A Electra Jr. in TWA colors... or a Naval A/C N3N-3. There were warbirds including a Grumman F6F Hellcat and two North American P-51 Mustangs. 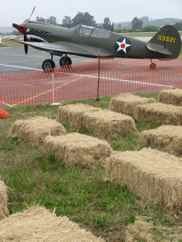 A Curtiss P-40 Warhawk was parked near Watsonville's folksy hay bales not bleachers seating. 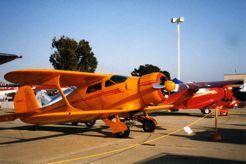 A 1930 New Standard D-25 was giving nostalgic rides. Isn't there a New Standard at every air show you've ever gone to? Gotta love 'em. 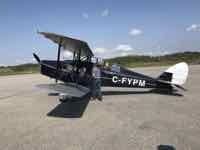 We tore our brother in law away from Piper Row long enough to look at the 1930 Laird LC-1B300. 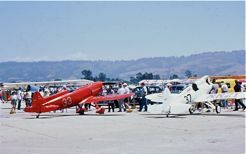 Sorry it has changed so... the Watsonville Fly-in was always one of our favorite little air shows. 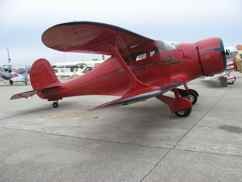 Please tell us about YOUR favorite antique airplane!